With the global village suddenly an electronic reality, the need for language tools has surpassed the scholar, the tourist and the international business-person. Everyone on the net has run into the language barrier or, at least, the experience of finding their screen filled with indecipherable characters. While the Net has created the problem of dealing with foreign languages, it has also made great strides in solving it. Programs that translate text for you, (while creakily off-the-mark at times), at least make your meaning known to readers in foreign countries and business can actually be done by using these translators. The next step is to gain personal control of what you say in another language and that requires you to undertake the daunting task of actually learning it. This has always been intimidating. Other than migrating to the country, anyone who has tried to learn its language has had to rely on traditional methods of instruction, High school and college courses, cassette learning tapes or crash courses before a trip. These are time consuming, tedious and seldom produce the fluency required. At last, there is something on the market that really works; "interactive" language learning systems on CD-Rom. I have just looked at three of these and I am delighted to report that the systems perform like nothing else. The ones I tried were each at a different level. The first, a talking picture dictionary by Softkey is very useful for building vocabulary. The second is a straightforward yet very helpful CD entitled EZ Language by IMSI. It installed quickly, was simple to use and great for beginners. Those two were both excellent for their purposes. If you’re looking for the basics in a language they are great. Then I opened up the cellophane on a system from Syracuse Language Systems, the box promised a lot. After spending some hours with this product I have decided to discuss it in full because this CD-Rom delivers. 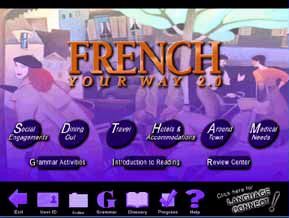 It has exceptional interactivity, comprehensiveness and an ability to really teach you the language. 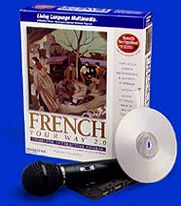 I chose the French CD-Rom, "French Your Way" (Beginner to Intermediate) and what I encountered was a revolutionary system. 1. It is fun, even addictively so. You just can’t help going on to the next screen, the next game, the next conversation. 2. It’s speech recognition capabilities are incredibly precise and perfect for learning a language. 3. Its scope is not limited, as is a cassette, a book, or the time of a teacher. It is a vast labyrinth of the language yet your way is clearly highlighted whether you are tracing the spelling changes in verb conjugations or playing the "negatives game." This game teaches you placement of negatives in a sentence more clearly, quickly and simply than any method I’ve encountered. 4. The system will repeat itself for you forever without getting tired or losing patience, until your hear such accolades as “merveilleux” or "formidable" or "fantastique" or until you hear the chime instead of the buzzer. 5. Lastly, and for some, most importantly, it removes the embarrassment attached to mispronouncing words or fumbling grammar in front of strangers. Once in the program, the screens are interestingly complex yet simple to use. The "branching" conversations are accompanied by hand-drawn, storyboard-style "panels." These conversations branch according to your verbal or mouse-clicked responses or they can be saved, so you may repeat the same conversation over and over until you have mastered it. You may choose to see the dialogue printed on the screen, or the words can be shown as little square blocks, indicating the number of words in the sentence but not the words themselves; very useful. You may choose to see the English translation or turn it off. (You can also turn off the accolades, chimes and buzzers if you’d rather). The games like as the negatives game and the crossword puzzles are all enjoyable. The grammar section is complete, as far as I could tell, and it is especially clear with the specifics highlighted so you always see the subtle but necessary changes in spelling and placement. There is a spoken glossary of all the words used and their meanings, as well as an index that takes you through the course without resorting to the bubble-prompts available on the screen. Try Something Different - Learn the Spanish Language while in Spain! The conversation groupings are broken down into basic sections such as Around Town, Dining Out, Social Engagements, Travel, Hotel and Medical. There is a menu section for food lovers and a geography/map section to help you figure out where you are and where you’re going. You have a variety of different ways to follow the conversations, and there is a dictation game where you are asked to type in the spoken words, phrases, or sentences, depending on the level you select. All the letters that require accents, such as acute, grave and circumflex (that do not exist on English language keyboards), appear on the screen and you click on them rather than typing in the non-accented letter. Voice recognition is miraculously precise, while forgiving less-than-perfect accents to a slight degree, correct pronunciation must occur before you will hear an accolade and be allowed to continue. If this sounds like a contradiction, here is an example: A phrase contained the idea "by taxi," because I mistakenly said au taxi ("oh") when repeating the phrase, I got the buzzer, it wasn’t till I said en taxi ("ah," with a hint of nasality) that I was allowed to continue. (By the way, the only typo or error I found in this massive learning tool was a printed text answer "le taxi" when the required vocal response was "en taxi"). This is a wonderful program, I recommend it highly. I am addicted to it. I can’t wait to jump back into it, so the comments that follow should not deter you from trying this great resource. That said, I had the following experience. As I installed the program I was suddenly presented with screens that asked me to sign up for a new Service Provider with a fifteen day free-trial pitch and other things that were going to improve my cyber-existance. 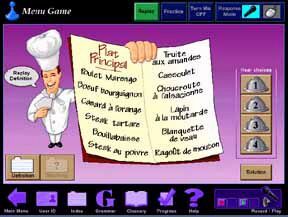 Suddenly I was led away from my anticipation of interacting with the French Language and was getting my credit card number out and doing all sorts of sign-on things unrelated learning French. When done, the time I had allotted for French was gone and I discovered I had allowed my home page to be taken over by the Syracuse Home Page. My computer gave me the feeling that it was totally taken over by what had just taken place. Accessing my bookmarks was different and all I wanted to do was get back to what I had had before I opened up this package. If I un-installed would I lose my bookmarks? I couldn’t risk that. Would my home page come back? I didn’t know. It turned out that un-installing was simple and did return my machine to its former, pleasantly familiar, configuration but not before I had sweated some bullets about it. Then I tried to get the program to let me access the internet through my own service provider, Netcom, using my browser, (the same one the program recommends, Netscape Navigator 2.0) but nothing doing. I still haven’t reached the resources of their Website through the program. Next, hours were lost trying to get the (thoughtfully included) microphone to work. It turned out I was running an eight bit sound card while the program required 16. Nowhere in the documentation does it say anything but "sound card." If you have a sound card, according to the documentation, it will work. The response from tech support was far from immediate, but did eventually occur. Lastly, in my list of "don’t likes" was the slowness of the system on a double speed CD-Rom, this problem is solved with a quad-speed CD-Rom. Well, I had to say those things because they happened, but would I give up my copy of "Syracuse Language Systems, French Your Way" because of some slow-ups and a few eccentricities out of the gate? The answer is "jamais, jamais, jamais!" I’m keeping this one.